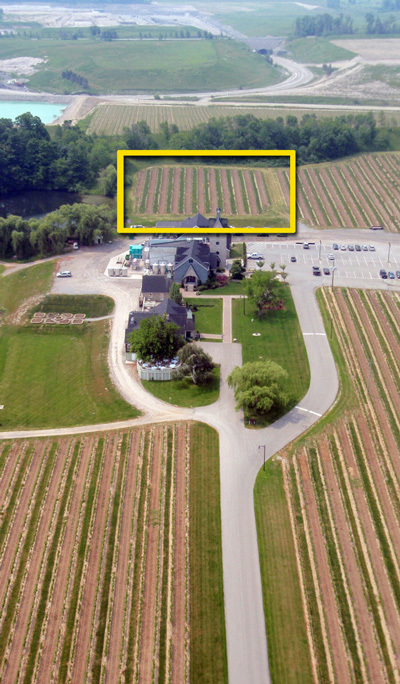 Former Field C is now the Connections Wine Club Vineyard. Please feel free to use the Connection Vineyard any time for picnics, strolls or if you are feeling up to it, some weeding. Hey, it’s your vineyard! Insofar as we can (unfortunately, some circumstances will not allow direct participation in a timely fashion), we will invite you to be part of the operation of that vineyard and to work with the wine that comes from the Connections Field. We are currently planning on building an open structure at the highest point of the Connections Field so you may have a place to seek shelter from the sun or rain when you visit it. We are also working to outfit that area with outdoor tables and a few chairs so you may wander up and have a comfortable place to relax over a glass of wine. Both weather and vineyard updates/operations have made these plans a bit challenging to complete but we are getting there. This is also the preferred site for our annual wine club BBQs. It is a beautiful site and the perfect setting for an outdoor party. But again, weather is our master at Vineland and it can cause disappointment from time to time. We are working on ways to even out that situation as well. We never stop working for you. Please consider this very special place your home, these vines are your own and the wine that comes from it your own personal wine. Welcome home!